At the end of World War II, while the rest of Europe settled for using war surplus military equipment to rearm themselves as they rebuilt their economies, the French struggled to instead introduce their own indigenous military vehicles and weapons. The ARL-44 Transitional Tank is one such creation. This 50 ton tank finds its roots in the Char B1 bis, one of the few prewar tanks capable of withstanding virtually everything the Germans could throw at it when hostilities broke out in 1939. The Char B was a flawed design, however, placing the main gun in the hull and leaving the tanks easily defeated by mobility kills as the Germans swept through France in 1940. French designers continued to clandestinely design the Char B's successor as the war progressed. After the war, the French government chose to build the tank that was designed with so much secrecy. The end result was an absolute monstrosity doomed to obsolesence before it was even built. Measuring more than 30 feet long and ten feet high, the ARL-44 is easily one of the most massive military ground vehicles ever built. Though armed with a 90mm gun placed in the turret, this tank was underarmored for the last years of the war, let alone the postwar era, and its vertical slab-sided armor would be easy prey for the new tank guns introduced right after the war. While far from perfect, the ARL-44 was the first tank introduced capable of going toe-to-toe with a Tiger II with frontal gunfire and not only survive, but kill the King Tiger in the process. In spite of this, the crippled French economy struggled to produce 60 of these titanic abominations, which served the French military from 1946 to 1953, before being replaced by the US M-47 and scrapped. These tanks were a vital morale booster for French industry and an important part of the French military as it struggled to hold the prewar French colonial empire together. 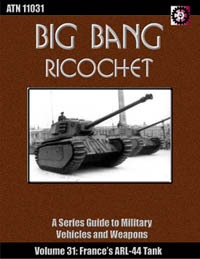 Included are Big Bang entries for the 90mm M3 tank gun and the Chatellerault light machine gun.